Seven Russian jets have reportedly been destroyed, and 10 Russian servicemen injured, following a mortar attack by “radical Islamists” at a Syrian air base. The attack took place on Dec. 31, 2017 at the Hmeymim air base, and if the reports are confirmed, it is being called Russia’s single biggest loss of military hardware since the fall of 2015, when Russia launched an airstrike in Syria. 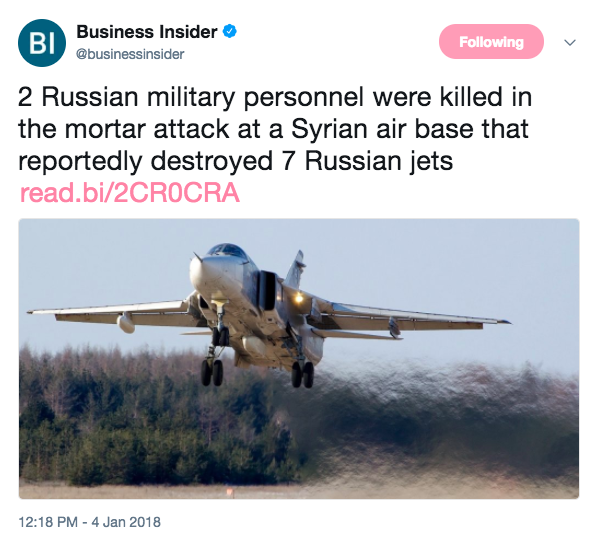 Reuters reported that at least four Su-24 bombers, two Su-35S fighters, an An-72 transport plane and an ammunition depot were destroyed, and Reuters cited the Russian daily newspaper Kommersant. However, Russia is pushing back against these reports, and its Ministry of Defense has since said that two military personnel were killed in the mortar attack, but that no jets were destroyed. “Last month, Russia began establishing a permanent presence at Hmeymim and a naval base at Tartous although President Vladimir Putin has ordered a “significant” withdrawal of his military from Syria, declaring their work largely done,” Reuters reported. And, the Russian Defense Ministry had earlier this week said a Russian Mi-24 helicopter crash-landed in Syria – also on Dec. 31, 2017 – and that the two pilots died, Reuters reported.